I need to hang a (light) decoration temporarily between two irregularly shaped stone outcroppings. I'm looking for something like a tension rod that I could place between the two stones (and would hang the decoration from the tension rod). The space between the stones is only about one inch. Is there anything like that on the market? When I search for tension rods, I only find those used to hang curtains, and they are way too big. This is supposed to be a temporary hanging, I can't modify the stones, and since the stone is irregular, those temporary glue hooks won't work. 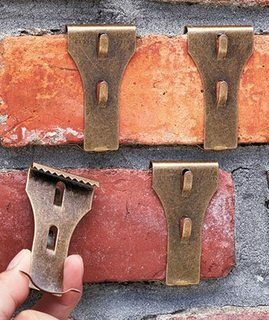 The first type is made for standard sized square bricks, but the second kind will work for any size bricks as long as they have a somewhat regular mortar line. 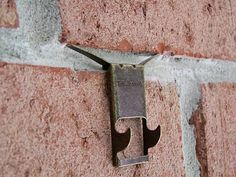 They can be found by searching for "brick clips" and are sold at the typical home improvement stores. Great for temporary or light duty use. What's the best way to hang an unframed poster on a sloping wall without using something that will damage the poster?